Time is one of the easiest things to lose track, especially when you work on multiple tasks and have different events to attend. Your desk calendar, sticky notes, reminder alarms can only do so much. 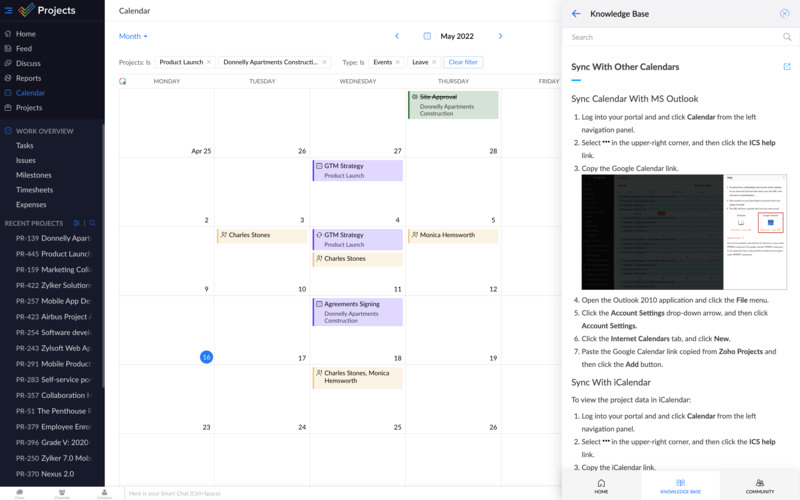 That's why you need an online shared project Calendar that will keep track of your own work items, give you a visual idea of what the team is doing and when, and help you get things done on time. 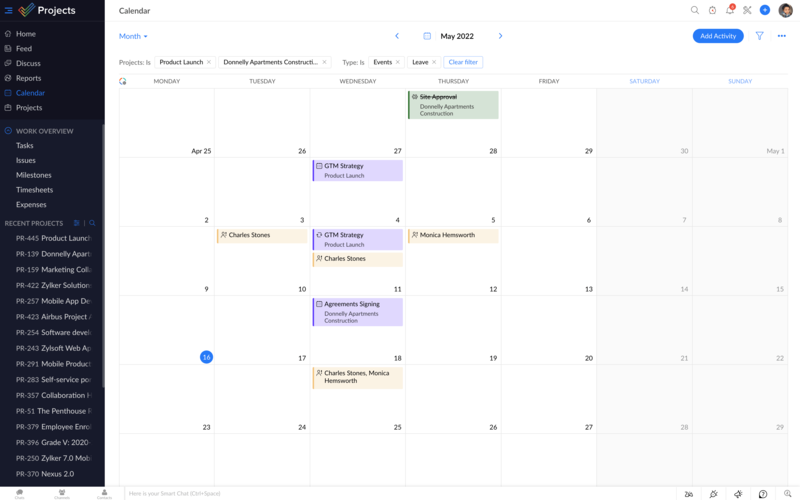 The Calendar module gives you a month-by-month view of what's happening in the project. 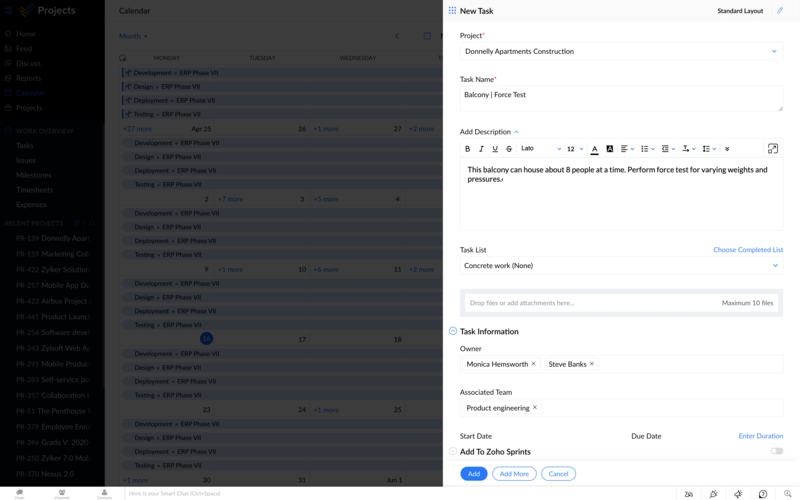 Just by clicking on a day, you can create new tasks, milestones, events or bugs, and assign them to the right people. Zoho Projects also supports Zoho People integration. If you plan to take a day-off, you can log it right from within the Calendar. You can also view who else isn't available on particular days. This helps you plan ahead and make sure targets are achieved on time. Remind event participants on time or a few hours in advance automatically to make sure nobody misses the meeting. The Events tab also shows you a list of Upcoming and Elapsed events, where you can add comments, attachments, or MOM to an event. You can update your project events in Zoho Calendar by subscribing to it. 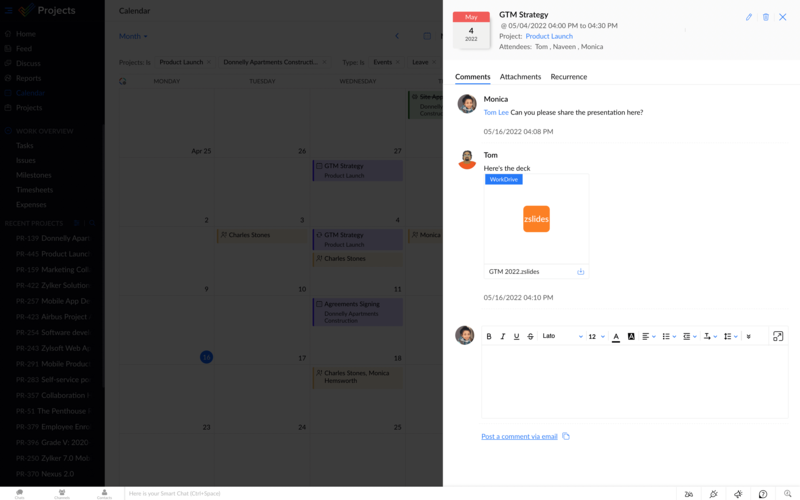 Zoho Projects also has options to sync your project Calendar with other third party calendars like iCalendar, Google Calendar and MS Outlook.